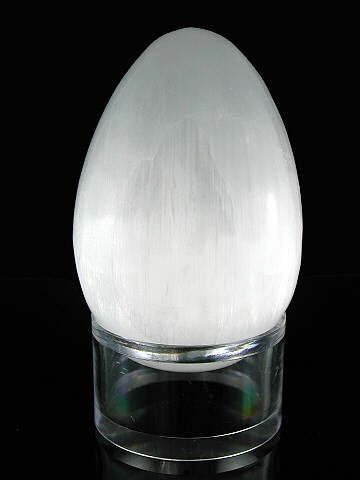 Heavenly and ethereal Selenite egg. Shimmering, magical Selenite resonates best with the Crown Chakra. It helps us to connect with our inner essence or true self; that which is beyond mind and body. It helps us to understand our spiritual quest in this incarnation by filtering out ego-based thoughts and emotions. Selenite in this form - an egg - emits a constant, gentle flow of magical, feminine 'Yin' energy into your home or environment. Sitting with a piece whilst meditating can help you better connect with your guides, angels or animal totems, and it is powerful enough to help cleanse Quartz crystals if placed within their energy field. Selenite is part of the gypsum family and is also called 'satin spar'.